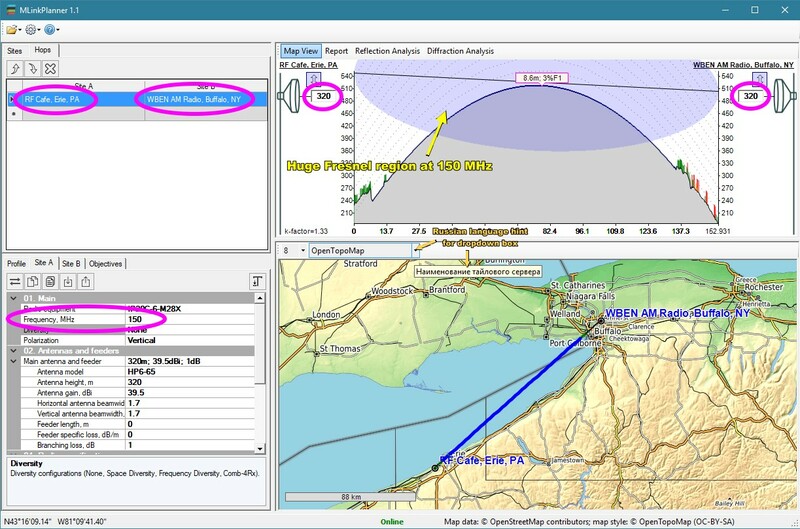 Mr. Oleg Sakharov, Director of the Center of Telecommunication Technologies, LLC, recently sent me information on the MLinkPlanner software for performing microwave communications link design. Judging only from the provided screenshots and the online documentation, MLinkPlanner looks to be very user friendly and loaded with features. I downloaded (and scanned with Norton AV) the 7-day free trial. I did a quick fictitious link between my house in Erie, Pennsylvania, and the WBEN AM radio station in Buffalo, New York. MLinkPlanner would not allow me to enter the actual channel frequency of 930 kHz (0.930 MHz) since it is evidently below its allowed range. I couldn't find a valid range listed in the documentation, but it is somewhere at or above 150 MHz (not surprising since this is a microwave planner after all). My route is mostly over Lake Erie, so there was not much in the way of obstructions, other than the curvature of the earth. The antennas are elevated to 320 meters (mounted atop non-existent hills) due to Earth curvature over the 153 km separation to get a line-of-sight shot. MLinkPlanner calculates a path loss of 119.6 dB, which agrees with what my RF Cafe Calculator Workbook gets. BTW, AM radio frequencies form ground waves that can follow the curvature, so elevated antennas are not necessary to cover long distances - just lots of power. The thumbnails below show my trivial effort. Other than the path loss, I did not make any effort to verify results. There are a few artifacts in the program that remind you MLinkPlanner is a foreign product, such as imperfect translation to English in some places and a few of the mouseover hints appear in Russian :-). Your trial files cannot be saved. There is a nag screen that pops up occasionally to remind you of the time remaining on the trial period. However, none of these are an impediment to your successfully testing the product for suitability. There are a lot of microwave point-to-point and point-to-multipoint planning software packages with varying degrees of ability, but good luck finding the price for most of them without contacting a sales representative. MLinkPlanner has an advertised price of $499 US for a single-user license. MLinkPlanner is a powerful and user-friendly software for microwave link design. MLinkPlanner was created by engineers with many years of experience in designing microwave links, from single hop access links to high-power long-haul trunk lines. MLinkPlanner has demonstrated its effectiveness in designing many lines that are operating successfully, in various climatic zones and terrains, from plains and marshlands to highlands. A special focus was placed on a convenient user interface, ease of using link path profiles and automating calculations to the maximum. Fully automatic generation of path profile with terrain elevation, tree height and height of buildings. Data sources: USGS EarthExplorer, High-Resolution Global Maps of 21st-Century Forest Cover Change Published, Department of Geographical Sciences University of Maryland, Jet Propulsion Laboratory California Institute of Technology, OpenStreetMap databases. All these types of geodata are downloaded automatically as needed; there is no need to worry about preloading the geodata. Moreover, you can edit an existing or create a new path profile manually. The application allows you to use any kinds of basemaps - both common (such as OpenStreetMap, OpenTopoMap, etc.) and custom ones. 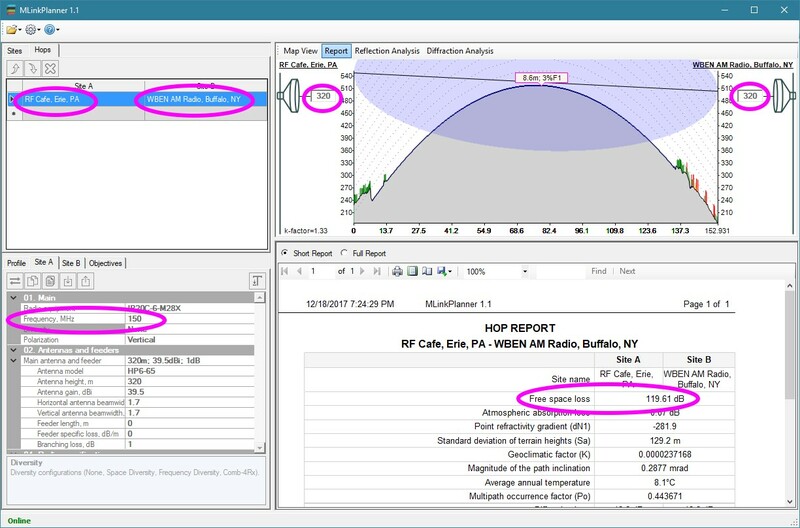 MLinkPlanner can perform the calculation and optimization of microwave link parameters, including: path profile analysis, multipath fade probability calculation, rain fade calculation, diversity improvement calculation (frequency, space and quad diversity), co-channel operation link calculation, error performance and availability calculation, reflection analysis, diffraction loss analysis. Center of Telecommunication Technologies, LLC (CTT, LLC) www.ctt-group.ru Novosibirsk, Russia is the developer of the MLinkPlanner software. The company has been on the Russian market for more than 15 years, and all this time we have been actively working in two directions - the design of radio communication networks and the development of software for design. During our work, our specialists carried out projects on more than 1000 microwave hops, more than 800 base stations of mobile communication, more than 100 television and broadcasting transmitters. The geography of the work is Russia, the main customers are mobile operators MTC, Megafon, Vimpelcom, Tele 2, oil and gas production, processing and transportation companies, as well as broadcasting companies. ​Until recently, we offered software only in the Russian market. Many design organizations, system integrators, telecom operators, TV and radio broadcasters, and government agencies in Russia and the CIS have been the licensed users of our software products. ​Now we are pleased to offer you the program MLinkPlanner, which was developed specifically for the global market. The program is a convenient tool for designing radio relay links with all the necessary functionality. In addition, the program has a number of unique functions for working with GIS. The MLinkPlanner capabilities will be complemented, further functionality is planned. Center of Telecommunication Technologies, LLC.